Near Mint: No apparent wear. Excellent: No chipping or fading of finish or enamel; no missing, yellowed, or darkened rhinestones; no worn prongs or edges. If stones have been replaced, it should not be obvious. 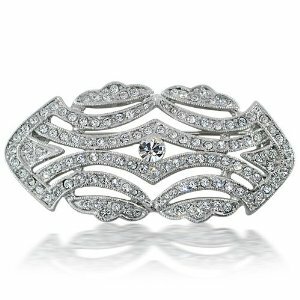 Very Good: No missing or dead stones, no peeling pearls, minor chips in the enamel or slight wear on the prongs or edges. Good: Any flaws do not affect wearability. Under a loupe there may be spotting in the foil, minor darkening or graying rhinestones, minor yellowing and signs of wear. Professional repairs. Fair: Visible damage, missing or darkened stones, broken closures, severe wear. Old repairs with solder evident on reverse. Poor: Stones chipped, scratched or missing; dents and holes in metal; some missing prongs.